Today, the Reserve Bank released the results of the November 2018 round of its Consumer Confidence Survey (CCS)1. The survey was conducted in 13 major cities – Ahmedabad; Bengaluru; Bhopal; Chennai; Delhi; Guwahati; Hyderabad; Jaipur; Kolkata; Lucknow; Mumbai; Patna; and Thiruvananthapuram - and obtained 5,326 responses on households’ perceptions and expectations on the general economic situation, the employment scenario, the overall price situation and their own income and spending. I. The current situation index (CSI)2 declined further in November 2018 in a phase that commenced in November 2016, on the back of growing pessimism on the general economic situation and the employment scenario as also some cutback in spending. II. 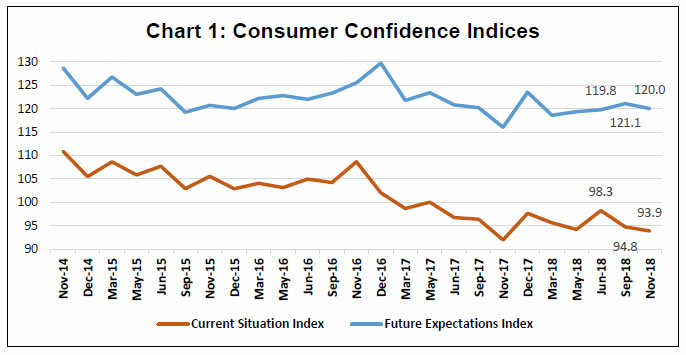 The future expectations index (FEI) also moderated due to lower optimism on the employment scenario and household spending (Chart 1). III. 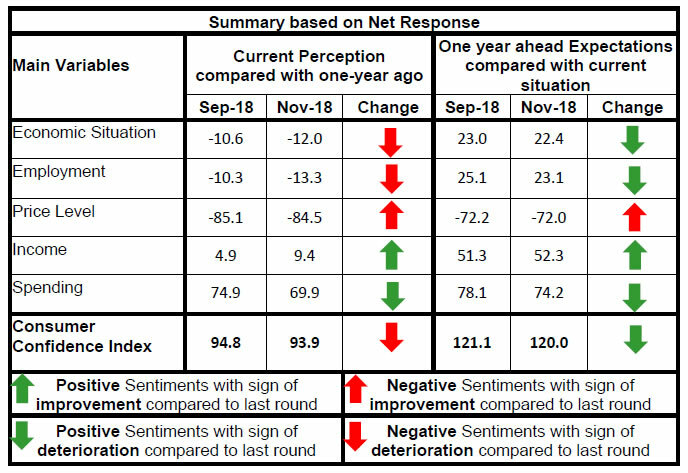 Current sentiment on the general economic situation dipped further into the pessimistic zone, while the outlook for the year ahead was broadly unchanged from the previous round of the survey (Table 1). IV. Sentiment on the employment scenario also deteriorated for the current period and for the one year ahead horizon (Table 2). V. Notwithstanding a marginal improvement in sentiment, consumers remained pessimistic about the price situation (Tables 3 and 4). VI. In contrast, respondents’ assessment on the income situation for the current year improved, and they also expressed optimism about their income one year ahead (Table 5). VII. There was moderation in sentiment on households’ spending with cutbacks expected in expenditure on non-essential items (Table 6, 7 and 8). *Applicable only for those respondents who felt price has increased/price will increase. 1 The survey results are based on the views of respondents. 2 CSI and FEI are compiled on the basis of net responses on the economic situation, income, spending, employment and the price level for the current period and a year ahead, respectively. CSI/FEI = 100 + Average of Net Responses of the above parameters.